Food for game day! The healthy way. Shhh! The healthy part will be our secret. Who doesn’t love a spread of delicious snacks to eat during game day… and in this case not just any game day – Super Bowl Sunday game day!? I certainly do. I also love putting my own healthier spin on staple game day/party snacks and appetizers. Although, sometimes I am hesitant to use the word “healthy” or “light” on game day in fear of giving the extremely hungry crowd of boyfriends, husbands, brothers and dads any pre-conceived notions. So I will refrain from using the term from here on out. We know these guys are here to eat. A lot. And not salads. These below dishes will definitely be a hit with our toughest critics. We’ll inform them after that they are indeed…healthy. As for us ladies of course we want tasty, but we usually are more cognizant of what we are throwing into these dips, casseroles and crockpots. Whether it’s sneaking in extra greens and veggies or replacing some of the hydrogenated, unhealthy fats, you won’t be able to tell with these delicious recipes! I have compiled a few of my favorite versions of tried and true appetizers we all know and love below. Remove from oven, and let sit for at least 5 mins before serving with whole wheat pita or tortilla chips, or my favorite – rice chips! 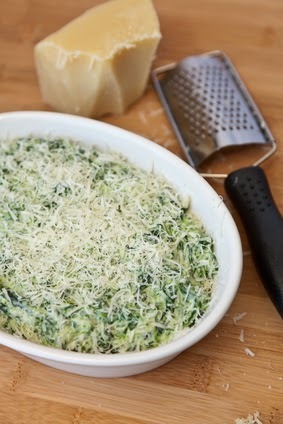 Open and add spinach. Stir until wilted and blended. Taste and add more spice or seasoning as needed. 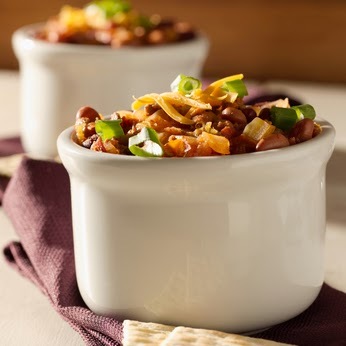 Serve the chili with the sour cream, scallions, radishes, avocado, daya cheddar cheese and tortilla chips. Place all ingredients in food processor or blended until well combined. Adjust flavors as needed. Chop into large chunks. Toss shrimp with a little salt, chipotle chili pepper, and fresh lime juice. Start by layering the romaine on bottom of a large parfait dish (or large glass bowl). Divide all ingredients in half except the shrimp. Layer each ingredient once and drizzle with dressing and fresh cilantro. This recipe is loaded with protein, lots of vitamins and minerals from all the veggies, fiber, and healthy fats. It is also highly addictive! Enjoy. This goes very well with Corona Light or an Agave Margarita 🙂 ) Tip for margaritas : kick up your favorite recipe by adding a little chipotle or spicy seasoning to the plate with salt. Mix the salt and spice and dip each rim glass before pouring. Last but not least- what is a party with out a cocktail? 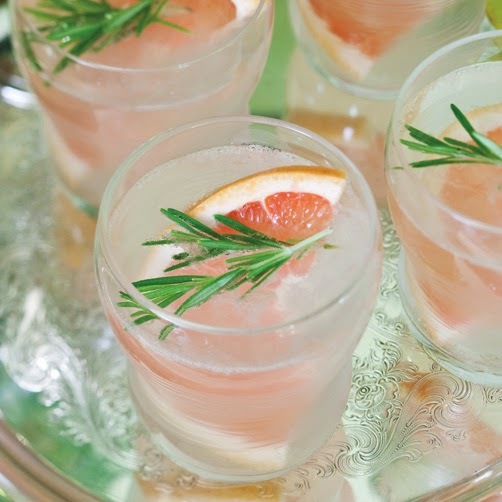 This winter Rosemary Grapefruit Cocktail is light, refreshing and so beautiful. In a pitcher, mix the rosemary syrup with the grapefruit juice, vodka and Triple Sec. Serve over ice with a rosemary garnish.